In a series of interviews over the past few months, Bartlesville resident, Jack Short, talked about the forgotten St. Louis Settlement established in the late 1800’s in Washington County west of the Caney River and his own childhood in that area. Just before statehood the St. Louis settlement, located on Cherokee land, had 75 people, Jack Short said. No one knows for sure why it was named the St. Louis settlement. “I don’t think any of them had ever been to St. Louis. I asked my dad and he didn’t know,” Short said. 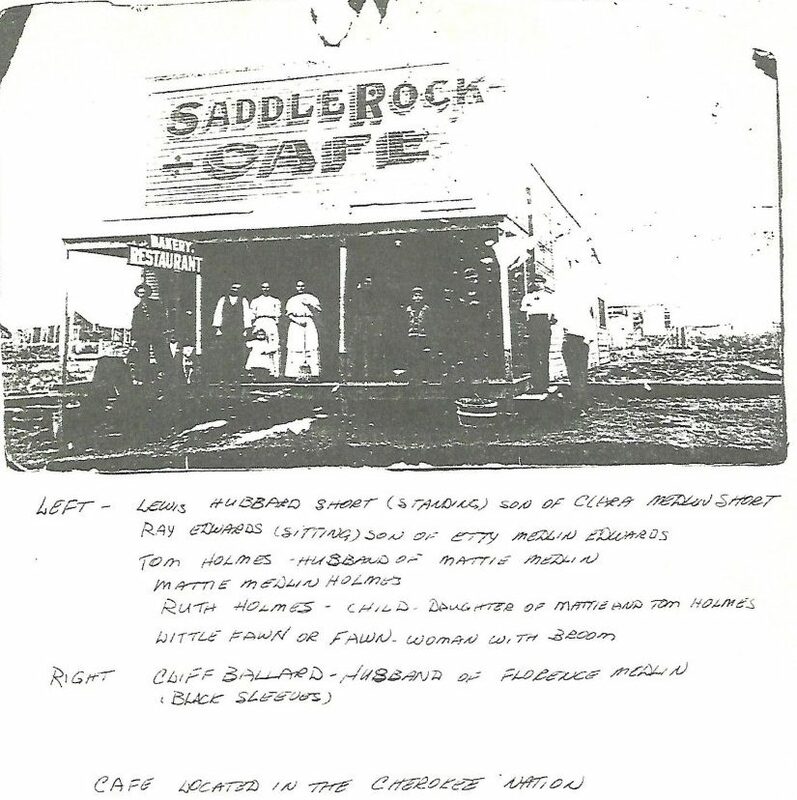 The St. Louis settlement had a school and the Saddle Rock Café. Short’s uncle, Ray Edwards, attended the St. Louis school, and was interviewed at age 12 about the school, Short recalled. The interview is from a book by Bartlesville author, Sue Smith, entitled “Recalling the Past of Copan, Dewey and Wann Areas,” copies of which are available in the Bartlesville Public Library. According to the book, the school was called the St. Louis Meeting House and also served as the church meeting place. His uncle’s maternal grandfather, named Medlen, was the superintendent of the school. The school was located west of the St. Louis settlement, and a couple of miles north, where the gravel road continues toward Caney and the blacktop turns west toward Hulah. At the foot of the big hill, turn east off the gravel road and the school was about a half mile back down toward the river. The land where the school was located eventually was owned by Amos Busman, the Edwards interview stated. 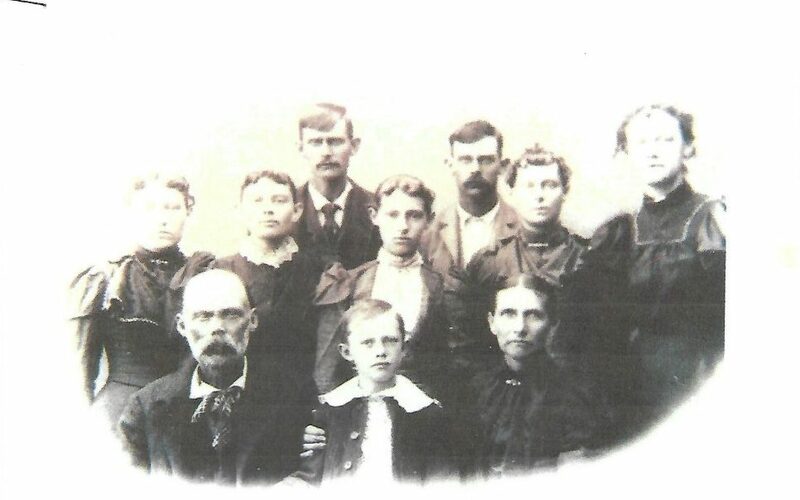 Shown in photo are members of Jack Short’s family who all lived in the St. Louis Settlement at one time. Front row: Wilson J. Medlen, Emmett Medlen, Nancy Ann Wiseman Medlen. Second Row: Mary Ellen Medlen “Matee”, Sarah Etta Medlen, Grace Belle Medlen, Clara Jane Medlen (Jack’s paternal grandmother who owned the Bar S Ranch and Saddle Rock Café in the St. Louis settlement), Florence Ann Medlen. (All of Short’s great aunts shown in the second row eventually moved to Copan) Back row: Lewis Medlen, Henry Harrison Medlen. In 1907, Edwards quit school at the age of 12 to help his father in his business making drilling rig and oil derrick timbers for the oil industry, which was in full swing. The interview quotes Edwards as saying, that with a group of six or seven hired men, Edwards father, William “Buck” Edwards, cut cottonwood or oak into logs and then squared them with a broadaxe. “This was terribly hard work … but it was just the way it had to be done,” Edwards said in the interview. Short’s father, Lewis Hubbard Short, was born in 1887 and moved to the St. Louis Settlement at the age of one. His family oral history is that his great, great grandmother, named Sarah Hale, travelled on the Trail of Tears from Tennessee. On her first trip, she returned to Tennessee, after not getting along with the Osage in Nevada, Mo., he said. Later Sarah Hale set out again and made it to the Oklahoma territory. “St. Louis never became a city because the railroad missed it. Most people moved over to Copan and so the settlement just died out. The railroad went on the east side of the river, so they were on the wrong side of the river,” Short explained. The family spread out over time. Several of his aunts moved to Copan. Short eventually settled in Bartlesville, where he lives with one of his sons, Mark Short, and his grandson, Kent Short. Jack Short, shown on the right, with his friend Al Jay Kester. Short wants people to remember the settlement because it documents the lives of pioneers living around the Caney River in Oklahoma territory. For years after the settlement dissolved, families continued to live around the Caney River. Short was born in Copan. Speaking of his childhood, Short said, “[t]his was the exciting part of my life. We moved west of Copan out on the [Caney] River. This was before dams and flood plains. When the Caney River got out, it got out for miles. Where we lived was on the river down there west of Copan and when the river got up, we had to go to higher ground. My dad would hitch up the wagon and team and there was about seven families that lived on these little islands with river on both sides. The river never did get in our house. My dad would turn all the pigs and chickens out and they’d roost in the trees and get wherever they could and the river would stay up for about five days. “After the river went down, these big fish would get trapped in the weeds and the grass and dad and these other guys would take gigs and flat bottom boats and catch ‘em and come back and we’d have a big fish fry. “This was on the west side of where the Copan Dam is now located in 1940 to ‘45. During those days, neighbors came together to make ends meet for their families. “These same people would gather in the fall because of the pecan trees. These were huge pecan trees. We didn’t get a sackful, we’d get like a pickup load. The native pecans are not as big as paper shells, but they were big for natives; these were humongous trees. We had one guy who would climb these trees, his name was Ardel Large; he would climb these trees and hook a rope up and hook it to the bumper of the truck and shake ‘em. We got new shoes and stuff because pecans was five cents a pound. The feed stores bought ‘em. During his childhood, Short also spend a lot time with his maternal grandparents, Jim and Meadie Gaddis at their home in Copan. They were born in Kentucky and married there and then travelled to Oklahoma Territory with Jim Gaddis’s parents. Jim Gaddis became a developer/builder in Copan. The first rodeo arena in Copan was on his land. 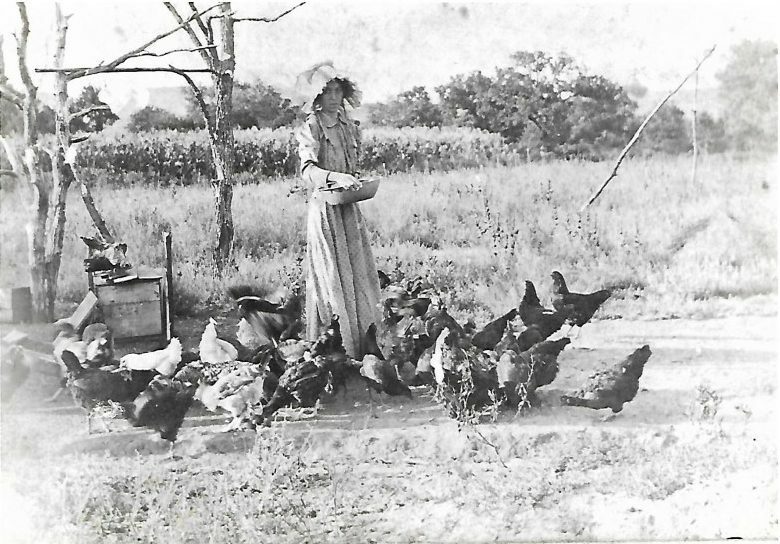 In Photo: Jack Short’s maternal grandmother Meadie Gaddis, age 18, feeding chickens in Oklahoma Territory. “I stayed with my grandparents a lot. We would get up. We’d go and do the chores. This was Sunday morning. Then my grandpa and I would sit in his big chair and listen to southern gospel music. 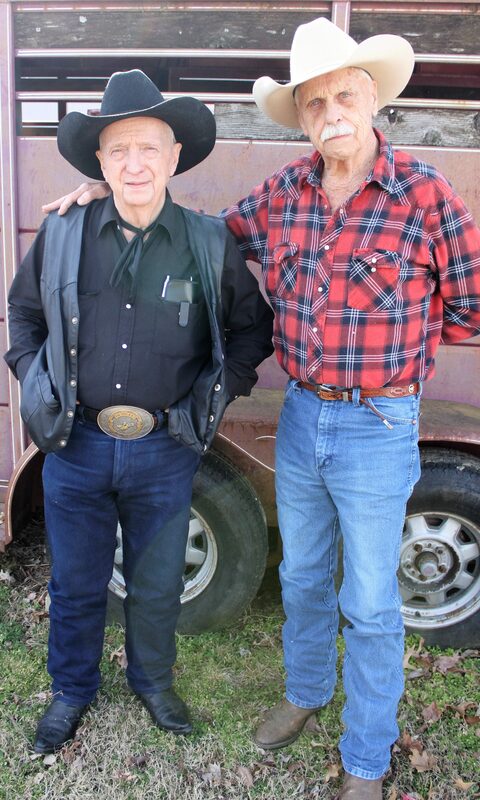 Look for Part II of this article about Short’s childhood, cowboy days and adult life.